I’ll be the first to admit I’m a typically very dark person. I like my movies and comics to be on the bloody side, and the same goes for games. So when I’m playing horror games, one of the first things I like to do is…. let my character die. Gruesomely. And what better time of year to celebrate the gory side of horror than Halloween! The Evil Within 2 explores the more psychological side of horror, but it still has an abundance of viscerally vicious moments – especially if you seek them out like I do. For me, it’s the perfect combination. You get to unravel the mystery of your situation and explore the chaos and terror unfolding in Union… and you also get to indulge in some good old-fashioned over-the-top gore every now and then. Which leads me back to my original statement. Sometimes I just like to let my character die, and sorry, Sebastian, but you’re just too fun to torture. Here are a handful of the best, most disturbing deaths in The Evil Within 2. It should go without saying, but if you have a weak stomach, stop reading. There are going to be gifs below. There’s no shortage of wonderful, terrible, beautiful, disgusting deaths to be had at the hands of The Evil Within 2’s monstrous lineup of enemies. But none are quite as thrilling as the the grotesque, giggling Guardian, whose numerous unique death animations will always keep you wincing. A particular favorite of mine leaves Sebastian without a leg to stand on. A wild swipe from Guardian’s saw arm cuts off one of poor Sebastian’s legs at the knee, and as he desperately claws his way across the ground in a futile attempt to escape, she swings once more and cuts him in half, ending his struggle. It’s a hell of a way to start this list. Anima is a something out of a beautiful nightmare. She’s an unkillable apparition that appears throughout the entire game, leading Sebastian on a ghostly cat-and-mouse chase through the darkest depths of his memories. My first death by Anima caught me by surprise. I was trapped in a memory of Beacon Mental Hospital, with Anima slowly wandering the halls, humming and searching for me. As I desperately looked for a way out, she drifted through a wall near me and was able to grab me before I could get away and hide. Whispers fluttered through my headphones and she began to pull the very life force out of Sebastian, transforming him into a withered husk. Even if I wanted to stop it, I couldn’t. It might not have been one of the goriest kills in the game, but it was certainly the most shiver-inducing. Getting killed by a Lament was an off-putting experience, even for me. As it turns out, I have a weak stomach when it comes to… well, the contents of one’s stomach. Specifically acid bile. The first Lament I spotted was surrounded by shambling Lost, and she wouldn’t have been too difficult to avoid altogether, but this was a murder playthrough, and I was there to get murdered. I sprinted through the horde of Lost – ignoring their reaching hands and howling groans – and headed straight for the tall, glowing woman in their midst. The Lament grabbed Sebastian as the Lost crowded in on all sides and leaned directly over his face, before proceeding to vomit directly into his face and mouth, melting the Sebastian I once knew into a gooey, red mess. Things that skitter and crawl give me the willies. The Evil Within 2’s Spawn race along the ground and leap at Sebastian with astonishing speed. Their massive, gaping mouths are full of wickedly sharp teeth and, yes, they can fit a grown man’s entire head in there. Something I learned when I let them get too close during an ambush in a parking lot. Two of these hellbeasts charged at me from the tall grass and one of them removed Sebastian’s head with a horrifyingly smooth crunch-and-pop motion. Intentionally dying during a boss showdown is certainly not a smart move, but sometimes it’s a necessary one. The moment my first real combat encounter with Obscura started, I sat myself in the middle of the room, ready for the killing. And, in a manner expected of one of Stefano’s creatures, it was decidedly artistic in nature. Obscura’s wiry extensions sprung forth and pinned Sebastian to the ground like a butterfly to corkboard. It’s much easier for her to get a good photograph of him when he’s an unmoving corpse. Who watches the Watcher? Me, apparently, when it comes to seeing how the Watcher takes on Sebastian. While not necessarily gory, the concept of being eaten alive is still unsettling. And that’s exactly what happens if you fail to escape The Watcher. It scooped Sebastian up and let his kicking legs dangle from its mouth for just a moment before swallowing him whole. Here in an instant, gone in flash down the nebulous Watcher’s gullet. I didn’t run into a Disciple until I hit Theodore’s domain (Theodore’s rogues’ gallery is completely separate from Stefano’s and boasts a whole host of fire-themed baddies). The first time I was taken out by a Disciple was an accident. I was trying to sneak up behind him for a quick stealth kill, but my timing was off and he caught me. The Disciple grabbed Sebastian’s head with his burning hands and squeezed until that sucker popped like a ripe, oversized grape. It was an unintentional death, but worth it to see Sebastian get turned into person juice. 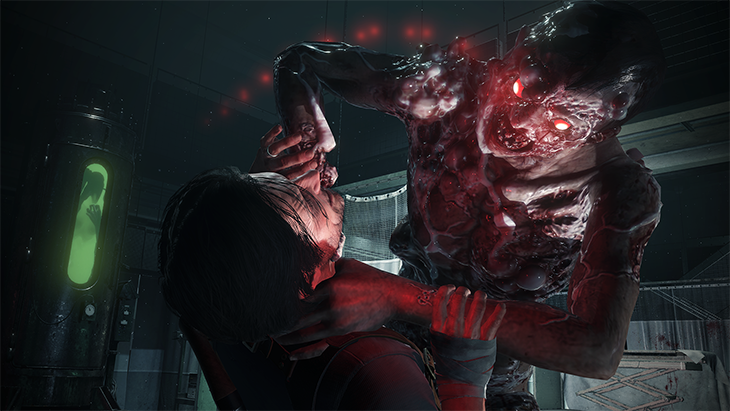 There are a handful of Harbingers in The Evil Within 2, although one of them is clearly more powerful (and more angry) than the others. My showdown with Theodore’s right-hand man certainly made me wince as I watched Harbinger impale Sebastian on the business end of his flamethrower and then burn him from the inside. Theodore’s minions clearly like their Sebastian well-done. That’s just a taste of the murder and mayhem waiting for you in Union. Who knows, you might even get some repeat showdowns with familiar faces from the first game… What have been some of your favorite murder moments in The Evil Within 2? 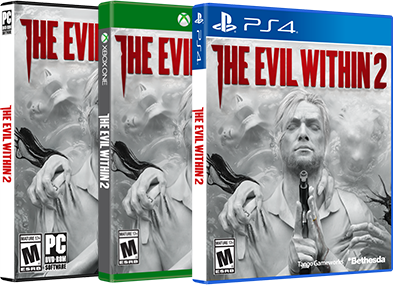 Drop your stories in the comments below or send them to @TheEvilWithin on Twitter. The Evil Within 2 is now available on PlayStation 4, Xbox One and PC. As Sebastian Castellanos, you’ll have to dive into hell once more in the sequel to the hit 2014 survival horror game from the mind of Shinji Mikami. Take on twisted creatures in horrifying domains and face off against your own worst nightmares as you race to save your daughter.